Next month sees the release of Game of Thrones versus History: Written in Blood in print on 17 April, 2017. Edited by Brian Pavlac and published by Wiley (small world! ), it’s a fun collection of pop culture linked with history. I’ve contributed a chapter on what the history of parenting can tell us about the characters and cultures of Westeros and Essos: “Rocking Cradles and Hatching Dragons: Parents in Game of Thrones” A lot of other great scholars have also contributed to this volume: I’m especially excited about Steve Muhlberger’s piece as well as the chapters by Kris Swank and Gillian Polack, all of whom were on board to contribute to the volume I’d planned to edit in 2013. Take a look: there are chapters on the Machiavellian world of Westeros and slave soldiers, along with so many other fascinating topics. I’m pleased this topic is finally getting a chance to be seen by so many, and ahead of season seven! Rather than seeing children as expendable pawns, historical fathers and mothers were normally expected to treasure them. Consider a fifteenth‐century story about a young girl badly injured by a fallen tree. Her father rushed to her rescue, “his heart wrung with an agony of grief: yet, lifting the log with some difficulty, he raised her in his hands. Then the fountains of his eyes were loosed.” The tale concludes with the desperate parents restoring their daughter to life and health through the miraculous intervention of the deceased King Henry VI (r. 1421–1471), to whom they prayed in their distress. These medieval parents’ devastation recalls the grief and worry weighing down Ned and Catelyn Stark after Bran’s horrific fall in the first episode. While some historical parents may have felt little or no emotional bond with their offspring, the Starks’ heartfelt love for their injured son would have been widely lauded in the Middle Ages. One of the most visually arresting moments in The Force Awakens trailer had to be the image of Darth Vader’s iconic helmet. But it’s more than the helmet itself, it’s what it implies. Examine the still closely – see how the worn helmet isn’t just shown on the remains of the pyre? No, this helmet has been carefully retrieved and preserved. It is a relic, a relic of the Empire. And relics have a long history in our own world. Maybe their stories will add some insight into what’s going on as we await the seventh movie. What is a relic? To a historian of Christianity, a relic is either actual remains or an artifact associated with a holy person. For instance, you could have a relic being a thorn from the crown that Jesus wore at his crucifixion or the bones of a saint, carefully preserved centuries after her or his death. Relics were preserved in churches but were also treasured by individuals who often sought out these significant remains. For instance, in the fourth century, St. Helena, mother to Emperor Constantine, discovered the True Cross upon which Jesus was crucified. The relic was revered not only for the historic connection, but for its miraculous powers, in this case, to revive the dead. Throughout history, relics not only memorialized the founders and great figures of the faith; relics also offered worshippers a chance to connect with the divine and the miracles that such a connection might offer. Many wealthy individuals collected relics or, at the very least, sought to visit and draw on their power. Some relics were as gruesome as Vader’s half-destroyed helmet, even more so. Bits of bone, hair and teeth were treasured by faithful followers. Many were housed in the most extravagant and sometimes macabre housings known as reliquaries, such as this bust of St. Yrieix, crafted in the thirteenth century to preserve a fragment of the saint’s centuries-old remains. In the trailer clip, Vader’s helmet appears with less ostentation but clearly some care. Perhaps a supporter of the empire’s restoration sought out the remains and plans to wield them for a Force-driven miracle or to inspire the masses? Relics had great power in the medieval world, no Force needed! Believers trekked across the continent of Europe and beyond on pilgrimages often to have a chance to view or touch a relic. One of the most famous pilgrimage destinations was Santiago de Compostela in Spain. This UNESCO Heritage site was first popularized in the ninth century for preserving the remains of the apostle James. Over the centuries, a great cathedral and a host of other buildings arose to celebrate the holy power and also to serve the thousands of pilgrims who flocked there. From the trailer clip, it appears that Endor doesn’t play this role for those who have retrieved Vader’s remains. 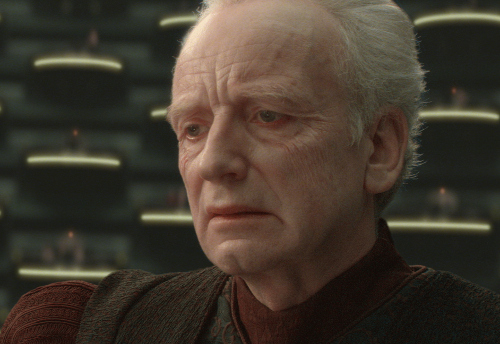 Who that is remains a mystery at this point: possibly the faithful followers of the First Order or one driven individual who seeks to wield miraculous powers wakened from Vader’s remains? In any case, I predict that Vader’s helmet will be employed like a medieval relic to inspire someone who seeks to restore the empire and the power of the Dark Side. For more on medieval relics and reliquaries, see the Treasures of Heaven online exhibit or the Heilbrunn Timeline of Art History’s Relics and Reliquaries in Medieval Christianity. Did you thrill to the trailer for Star Wars VII: The Force Awakens? Then you remember seeing this daunting hulk of a Star Destroyer on the desert world of Jakku: According to other reports, these wrecks are relics of a fierce New Republic engagement with the Empire’s forces fought a year after the Battle of Endor in The Return of the Jedi. Such monumental remains have their echoes in our own history only instead of star destroyers, ours are naval vessels such as the Graf Spee whose shattered remains cast an impressive shadow that still resonates today and provide interesting hints about how The Force Awakens could unfold. 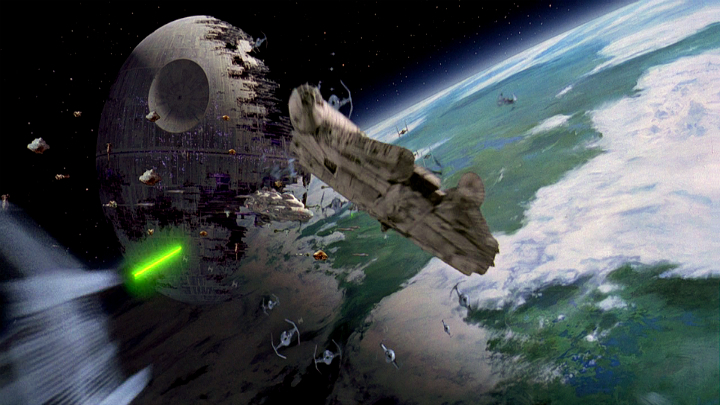 Here’s Historical Prediction #1 for The Force Awakens: thirty years on, that wreck is still of value. That’s a lesson we learn from the story of the pocket battleship Graf Spee. It was the autumn and early winter of 1939: the opening months of World War II. The German pocket battleship, Graf Spee, preyed upon British merchant vessels: sinking or capturing nine before the British were able to turn the tables. Three British cruisers, the Exeter, Achilles and Ajax wreaked havoc upon the German ship in what is known as the Battle of the River Plate. They forced Captain Langsdorff to seek refuge in the neutral Uruguay harbour of Montevideo, on 13 December, 1939. However, the Germans couldn’t linger long in the port under the terms of the Hague Convention. Technically, they were supposed to be out of the port within a day! The captain stretched out his reprieve, offloading prisoners of war from his earlier successes and communicating with his superiors back in Germany. It was all to no avail as the three British cruisers waited not far off. 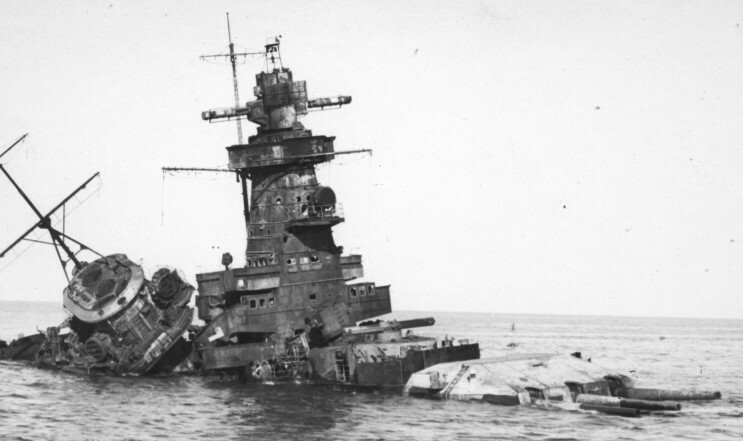 Rather than risk his ship’s capture, Langsdorff chose to scuttle, deliberately sink, the Graf Spee in the shallows on 17 December, depriving the British of a valuable prize but also his German masters of a defiant end. Just because the ship went down didn’t mean that all was lost. If the British could get access to the wreck, still largely accessible to the tugs that operated in Montevideo and divers who could pry out prizes, they could plumb some of the secrest of the German navy. But Uruguay was still officially neutral: the country didn’t declare for the Allies until January, 1942, after Pearl Harbor. Nevertheless, the British devised a clever plan. The German government was persuaded to sell the wreck of the Graf Spee to one Julio Vega in 1940. In reality, the purchase was orchestrated by the British ambassador to Uruguay, Sir Eugen Millington-Drake. 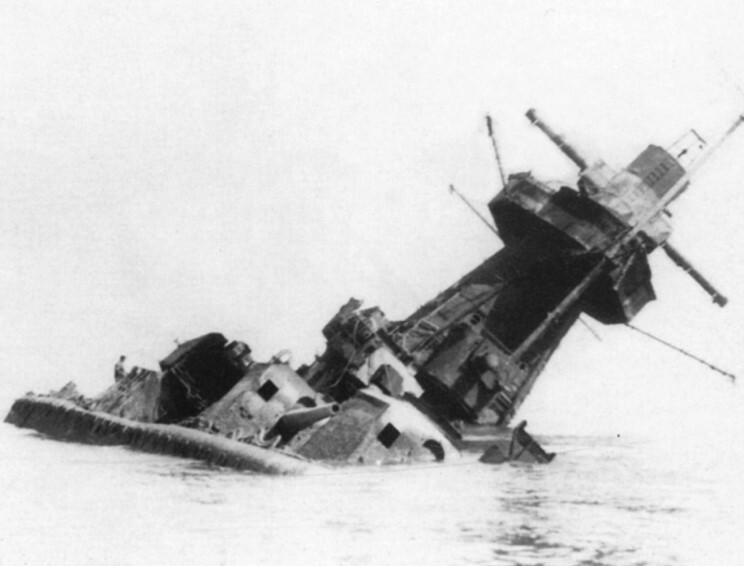 Parts of the wreck were then removed and studied by the British during the war. Even today, the wreck remains a highly sensitive property contested by private salvagers and the German government as recently as 2008. That Star Destroyer that we see in The Force Awakens could also be prized by salvagers as well as the rival powers of the Resistance (the remnants of the Rebellion) and the First Order (the Empire’s aftermath). 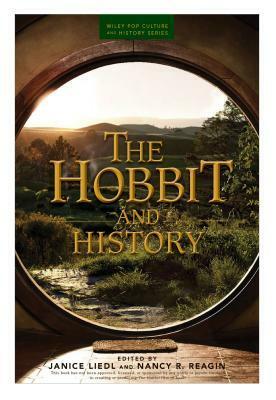 In conjunction with Goodreads I’m giving away two copies of The Hobbit and History. The contest is open to residents of the US and Canada (sorry but holiday post makes this a crazy time to ship packages farther afield) and entries close at midnight, EST, on Tuesday, December 9. See the giveaway details and enter to win! The Hobbit and History is out. Do you have your copy yet? In the second chapter of the collection – “From Oakenshield to Bloodaxe: The Viking Roots of Tolkien’s Dwarves”, you learn about the thirst for vengeance in Tolkien’s dwarves and in historical Viking culture. Thorin Oakenshield was hardly unique in holding a grudge against those who had brought his family down. 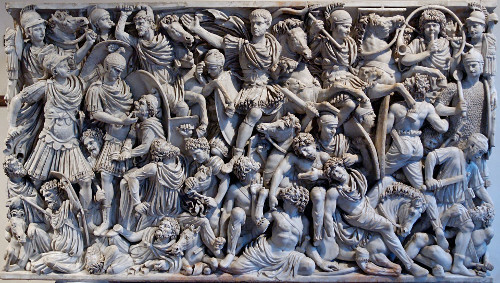 Medieval leaders waged bloody and devastating wars to right wrongs against their families. Consider the case of Ívarr the Boneless, a ninth century Dane who led a massive army to seek vengeance for his father’s death. Ívarr the Boneless was a Viking warrior. 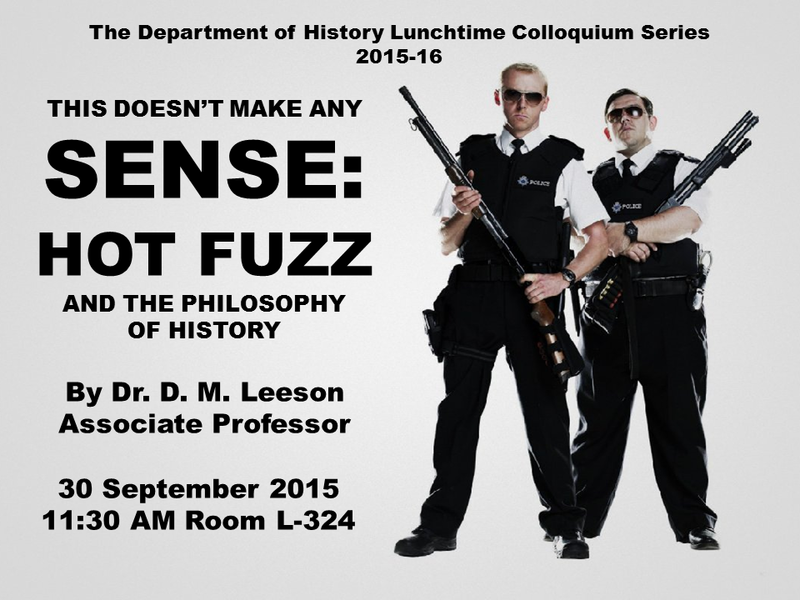 His epithet may seem odd and has inspired furious debate. Did he have a degenerative bone condition, perhaps osteogenesis imperfecta? Was he extraordinarily limber and the byname a sort of joke about his flexible maneuvering? Or maybe the story began in some great act of daring, just as Thorin Oakenshield takes his epithet from his quick thinking on the field of battle. Historically, Vikings weren’t only concerned with warfare and vengeance. They were also great traders, explorers and ambitious settlers. Some ventured as far afield as Newfoundland and Istanbul, and Viking hoards have been found to contain such exotic treasures as Arabic coins and a statue of Buddha. As a recent exhibition at the British Museum reminded us, the Vikings were more than bloodthirsty marauders, they were poets, artisans and adventurers. But the Vikings were also devoted to their families and friends. Insults against a friend could spark a bitter rivalry. 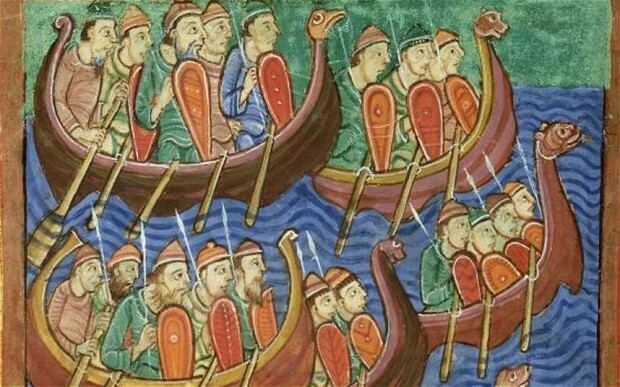 Attacks against a relative often spurred the Vikings onto war. As Colin Gibbons notes in The Hobbit and History, Ívarr lost his father, Ragnar Lodbrok to a cruel and vindictive opponent, King Ælla of Northumberland. The Scandinavian king was reportedly executed by being cast into a snakepit. His sons were incensed at their father’s ill-treatment and mounted an invasion of the Anglo-Saxon kingdoms at the head of what is sometimes know as the “Great Heathen Army”. From 865-869, Ívarr rained ruin upon his English enemies. He and his brothers saw Ælla pay the final, horrific price for his execution of Ragnar. After conquering much of the Anglo-Saxon lands, Ívarr turned to Ireland, conquering there. 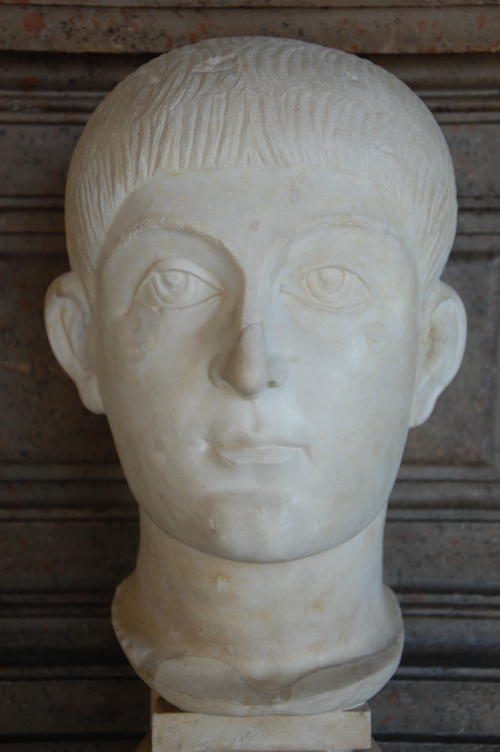 By the time of his death, likely around 873, he and his brothers had triumphed over their enemies. So, too, Thorin Oakenshield seeks vengeance against those who have wronged his family – Smaug who seized their royal stronghold and others as well. His thirst for vengeance is as strong as that of any of these historical Vikings. Learn more about the parallels between the Vikings and the dwarves when you read The Hobbit and History!